BMW signs engine-supply deal in the U.S. Engines for the Carbon Motors E7 purpose-built police car will arrive in mid-2013. BMW Group will supply U.S. startup company Carbon Motors Corp. with 240,000 diesel engines, cooling and exhaust gas systems and six-speed automatic transmissions for Carbon's E7 car, designed specifically for police use. "The first engines will be delivered in July 2013," said a spokesperson for BMW of North America. Carbon Motors has received more than 12,000 orders since mid-2009, the spokesperson said. Carbon ordered BMW's 3.0-liter inline six-cylinder turbodiesel -- the same engine used in the X5. The engine for Carbon is rated at 245 hp and 400 pounds-feet of torque (542.3 Newton meters). It will be built at BMW's engine plant in Steyr, Austria. 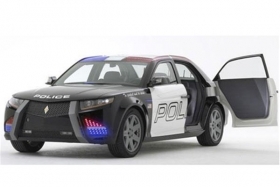 Carbon Motors was founded in 2003 to develop and assemble a rear-drive police car. The Connersville, Indiana, company is still developing its first production vehicle. The announcement was made Monday at the 2010 Government and Security/U.S. Law Enforcement Exposition in Washington D.C.
Ian Robertson, the BMW board member for sales and marketing, and William Santana Li, Carbon Motors CEO, signed the contract at the event. "We announced the expansion of our powertrain system sales business as part of the company's Strategy Number One," Robertson said. "Today's agreement with Carbon Motors marks another important milestone along this route -- with others to follow." Compared to a police car with a gasoline engine, Robertson estimated that the diesel-equipped police cars will reduce fuel consumption and CO2 emissions by up to 40 percent. The police car market comprises about 65,000 vehicles annually during good economic times. The Ford Police Interceptor is the top seller, followed by the Chevrolet Impala and Dodge Charger. The Ford model will be discontinued in 2011, replaced by a police vehicle developed on the front-drive Taurus platform. General Motors Co. will import the rear-drive Chevrolet Caprice in 2011 from its Holden subsidiary in Australia. That car shares a vehicle platform with the Pontiac G8 sedan.